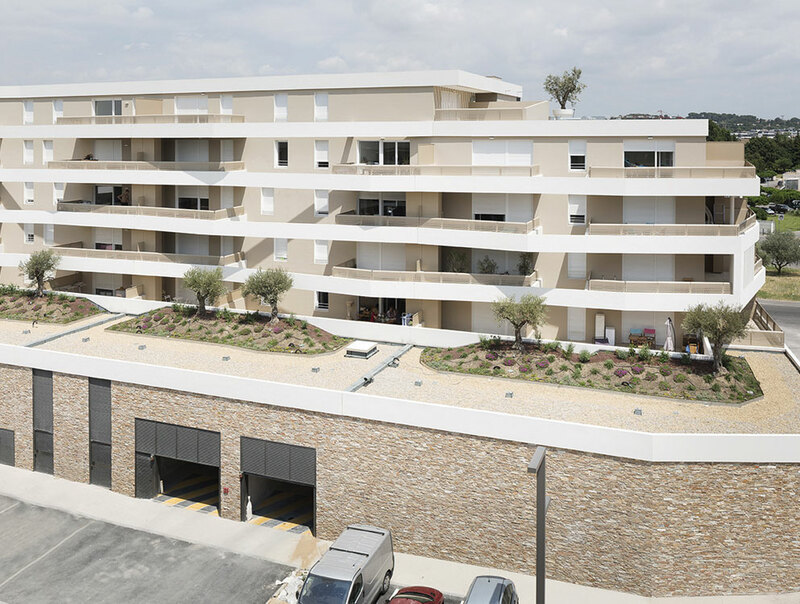 The new Mas de Rochet district in Castelnau-le-Lez, just outside Montpellier in the south of France, is 4.7 hectares and consists of 413 new homes, including apartments providing private, social and luxury housing. Situated on the site of an old sand quarry, bordered by low but steep cliffs dug from the compacted sand, the buildings’ facades and geometry have been designed to replicate the distinctive materiality of their surroundings. 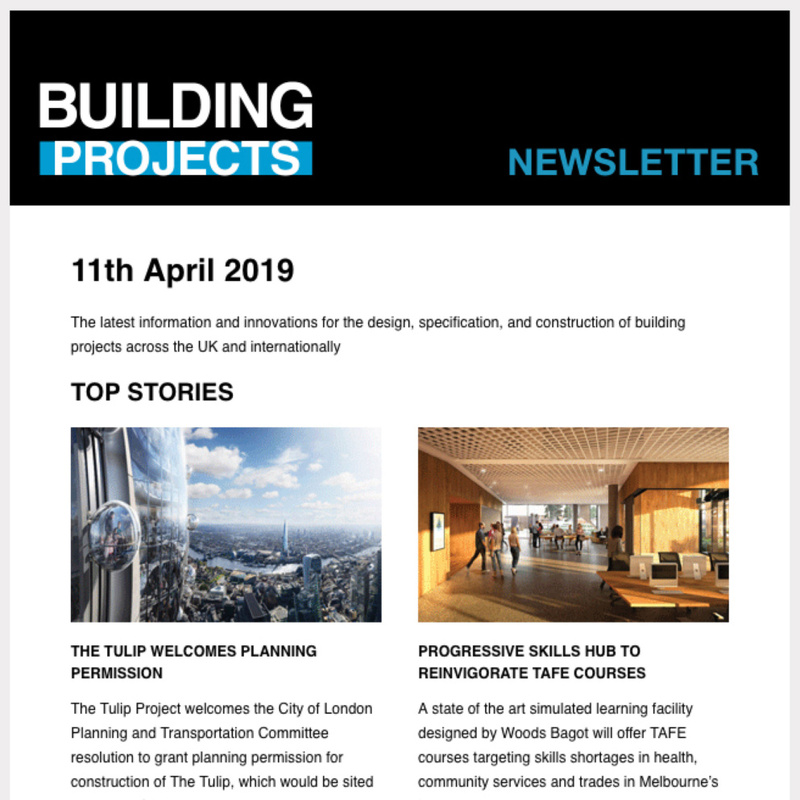 Urban developer GGL commissioned A+Architecture to conduct an ‘urban study’ on the site, and subsequently to design the whole scheme. After dividing the land into four lots, each was then sold to a separate developer – namely Amétis, Idéom, Nexity and Helenis. 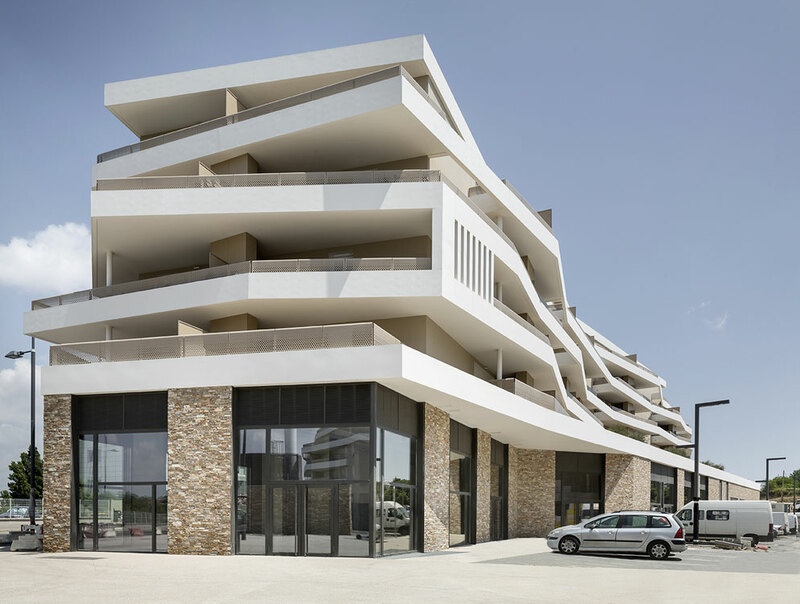 A+Architecture has substantial experience in both private and public housing, as well as in urban planning programmes of comparable size to Mas de Rochet. They, along with two other architecture practices, took part in a design competition for the project. The existing groundwork was not modified from its former iteration – the architects in fact exploited the outline of the old quarry to use it as the frame for the development, and give the impression the buildings were “carved into the ground itself.” Built around a single path as a cul-de-sac, vehicular access is kept to a minimum as necessary, while 218 car parking spaces provide plenty of provisions for storage. The development features a range of different housing typologies. 33 per cent of the homes (126 units) were dedicated as social housing, and provided by Amétis, plus a further 109 homes as senior long term care units, developed by Nexity. In addition, 14 per cent were allocated to Idéom, as 52 first-time buyer market homes, and 25 per cent as 97 high-end homes from Helenis. As well as the new homes, the development includes the provision of a community centre, a district heating centre, and shops. There are two social housing apartment blocks, one of which borders the road and also houses the retail units and the municipal centre which occupy its ground floor. Both buildings have what the architects describe as a “classic distribution scheme of halls and corridors.” The heat production centre provides district heating to the homes, utilising an economical biomass woodchip-based district heat network. Planned in grouped duplexes, the 52 homes for first-time buyers all have at least a small garden, with some of the homes offering an additional entrance terrace. 50 parking spaces are located in a basement underneath the homes, intended to provide equal access to all housing units. 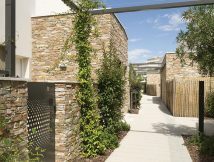 These homes are organised as a small pedestrian village, with narrow paths, open areas and frequent areas of vegetation offering important amenity to residents. The 109 flats providing for senior residents function as though it were a hotel, the ground floor offering communal services such as a lobby, restaurant, lounges, a games room and a hairdresser. Each of the 97 ‘higher end’ flats are distributed around a large central six-storey hall, with the top floor occupied by a common terrace. The form of the apartment buildings provides a paradox of seeming somewhat random while uniform, maintaining order despite each storey being offset visually thanks to the intermittent protrusions of their balconies. A large, white-rendered balcony, cantilevered around the perimeter of the buildings, delineates each storey. These balconies protrude from the building’s core to varying degrees, with their sharp corners placed at different, unaligned points. This creates a complex offset form, which seems without an obvious analogue in terms of function, but provides a visual playfulness, the balconies shifting and warping as they run around the buildings. A distinct geometry provided to the apartment buildings helped drive this dynamic aesthetic, and provides large, functional outdoor space. To meet local planning laws, and in order to attain the targeted density and heights, the architects designed the deep balconies, protected from the sun, for all the apartments, bringing an element of the outdoors into living space for residents. Two types of railings were specified on the balconies, with both screen printed glass, as well as laser cut and powder-coated steel. The balconies are also intended to reinterpret the site’s former use, mimicking the rough and unpredictable landscape. 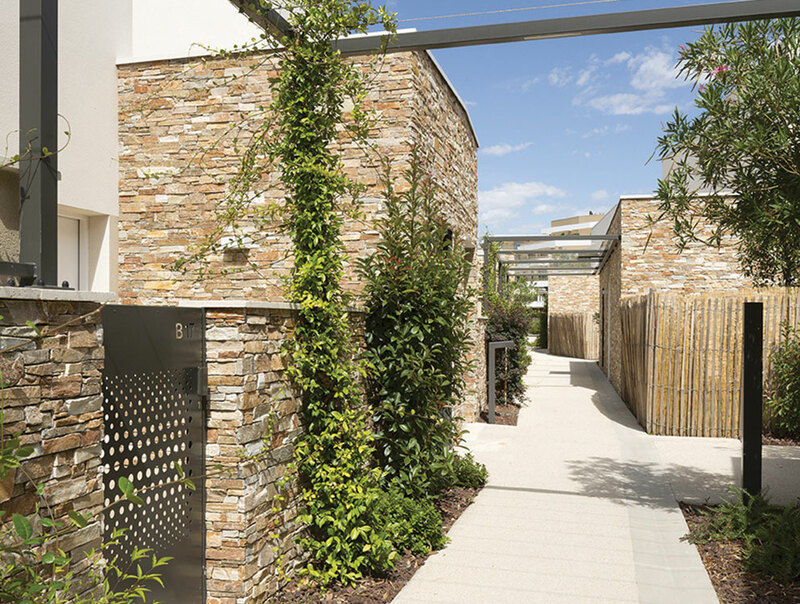 The stone cladding (sourced from China) used on the lower parts of the homes further the project’s depiction as a ‘piece of the earth’, adding a natural texture to the facade. The architects claim the intricate but somewhat haphazard form is inspired from the ground beneath and around the project, which is displayed proudly in the development’s colour palette. Across the development, the facades offer earthy tones reminiscent of rough sand and dirt, contrasted by the bright whites of the balconies and first-time buyer homes. This colouring is accentuated in the intense sunshine of Southern France. 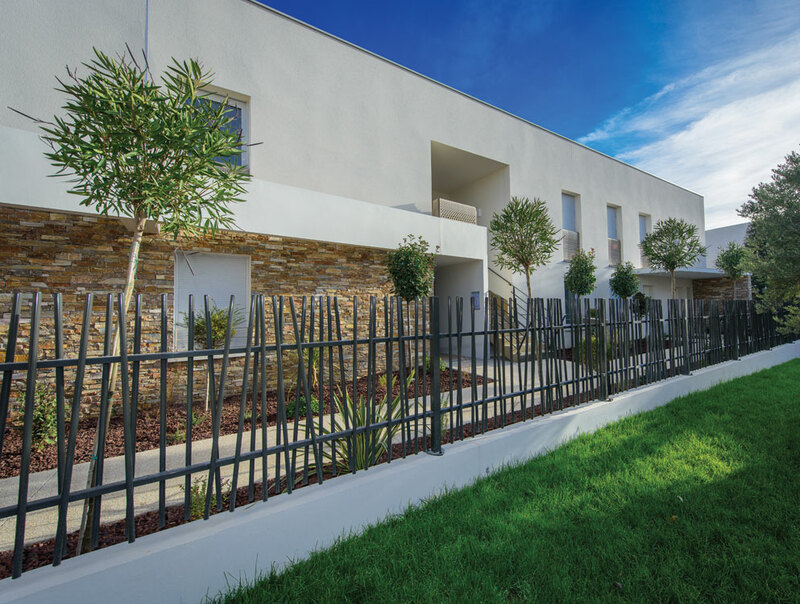 The colour scheme selected by the architects for the facades and railings differs slightly from one section of the project to another, while always utilising natural shades of Montpellier sand across the board – ranging from yellow to Siena. With senior care in particular, but also strongly the case for some of those in social housing, it is easy for residents relocated into assisted housing to feel marginalised by society. While design for such facilities has progressed in leaps and bounds in recent years, care homes often ring of separation and abandonment, of being swept aside by society into a corner. Social housing has carried a similar stigma, with council blocks separated from regular private housing. 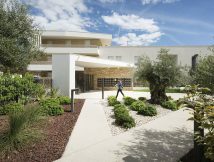 However at Mas de Rochet, there is no immediately obvious separation between the apartments for senior care and the other tenures. This will, the team hopes, significantly help towards engendering a strong sense of community in the development, promoting togetherness as opposed to being ostracised from each other. 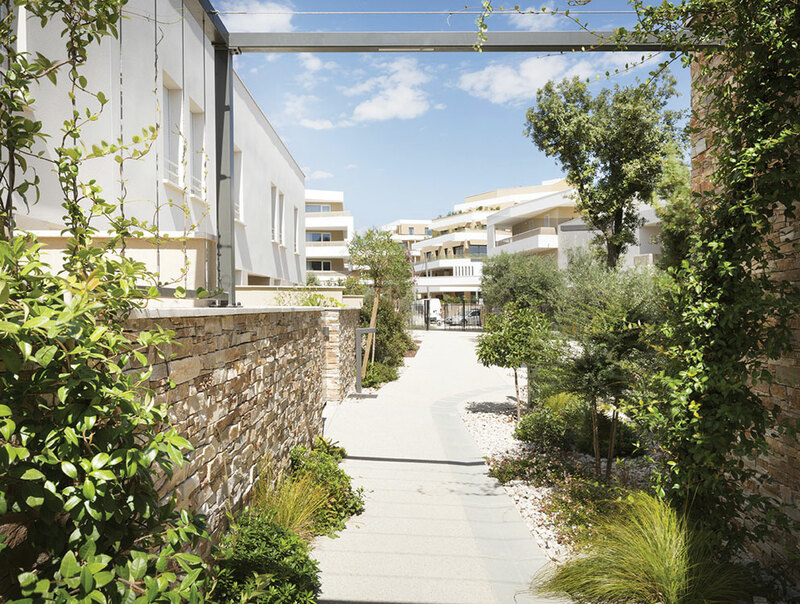 To continue to encourage this community spirit, a ‘municipal centre’ has been built among the public space in the senior care building, surrounded by well-tended greenery, which features across the whole development. This building, called “La Maison des proximités du Mas de Rochet,” has been provided in an effort to combat potential isolation among residents. As well as including information on local facilities and events, it enables them to socialise with other residents, and helps bridge generational gaps. With the population ageing in France as in the UK, the topic of how to care for our elderly has never been higher on the agenda. To combat any sense of dislocation, the social care apartments have been placed in the heart of the community, designing them from the outset as a part of district’s ‘general population’. At this development in particular, as is a growing trend in homes for both the young and old, the approach to modernise assisted living for the elderly of Mas de Rochet has been to imbue a perception of hotel living into the apartment block. Residents will be greeted by a hotel style lobby, and can take advantage of a range of on site amenities, including a restaurant, relaxing in the games room or one of the lounges, and perhaps get a new style from the in-house hairdresser. All of this provides the assistance and care that the residents will need, but introduces it in an unobtrusive, familiar way. It also strengthens the community inside the building itself, with residents able to socialise outside of their homes, but within a nearby, safe, accessible location. 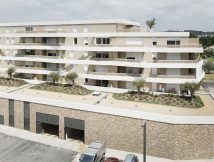 Rather than create any kind of dichotomy between the more and less expensive homes, the entire new district of Mas de Rochet retains a common sense of place in its design. The 52 houses for first time buyers, while separated into duplexes a short walk from the apartment blocks, offer the same mix of rough stone, earthy browns and yellows, and stark whites on their exterior. It is important for many who design buildings to ensure that the line between the natural and the man-made is not too thickly drawn. It is a time-honoured technique to introduce vegetation externally in such developments to offer a beneficial impact on both the physical and mental wellbeing of residents. This project is no exception, providing the architects, who also undertook the landscape design, with an opportunity to add the natural complexities of nature into something as functional as a walkway. There was no vegetation at all on site when the architects began their work designing the project. After the quarry ceased its activities, a small concrete brick plant was established, and a concrete slab covering the entire site was laid. This, of course, meant that all vegetation now seen on the development had to be planned, and planted. Access by car to the site is strictly limited to a circular road in and out, which allowed for the multiple central plots, all pedestrianised, to be widely planted upon. The relatively unstable cliffs around the site were consolidated by adding new earth banks, which were also generously planted to bring more life to the homes’ surroundings. Greenery is a central theme across Mas de Rochet, contrasted with the earthy palette of the surrounding buildings and white concrete pathways. Dedicated and well-tended plant beds can be seen frequently on the circular road, split into triangles and other geometrically distinctive shapes, and contrasted with both dirt and white gravel beds which provide attractive breaks between the pathways. The focus is less on flowering varieties, but more on Mediterranean plants with low water demand; trees, bushes and climbing species providing crucial colour and life to the development. A central focus of the design of the new district, open communal areas encourage community by increasing the likelihood of serendipitous encounters between residents, and providing them a place to meet and socialise outside of their homes. Contributing towards this, parallelepiped stone seating has been placed intermittently besides the plant beds, encouraging residents to have a moments’ respite in the communal areas. 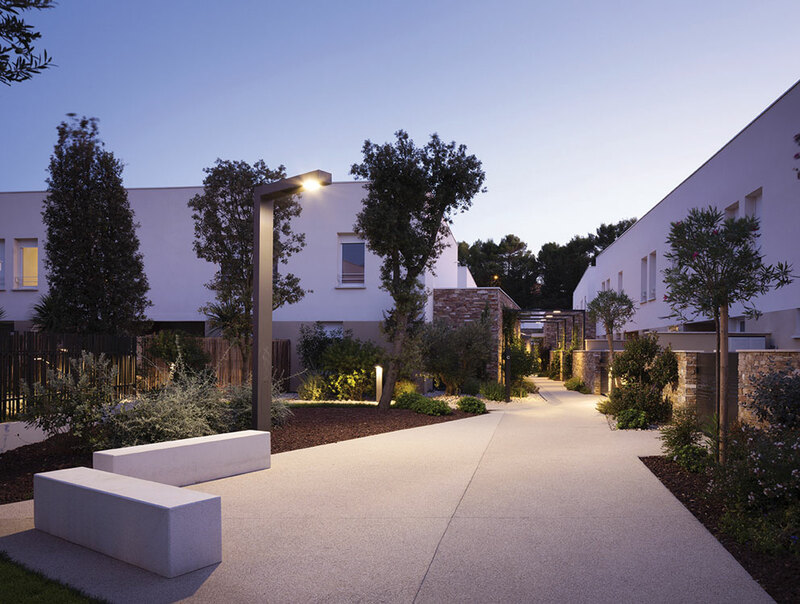 To ensure these benefits can be enjoyed at all times of day, as well as improving safety standards in the darker hours, all of the outdoor communal areas are well-lit. Much of the lighting is provided by tall lamp-posts, designed with a sharp-edged style that complements the buildings they illuminate. Pride in a living space can be instrumental in turning what might otherwise be isolated living spaces into a part of a community. It is therefore advantageous for architects to be able to introduce beauty and elements of architectural significance into people’s homes, providing residents with something to appreciate, as well as show off to friends and family.